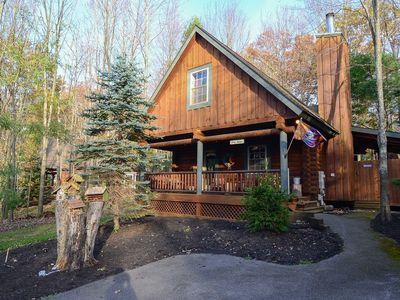 Experience the Magic of Deep Creek Lake in a Comfortable & Cozy Log Cabin in Yellowstone Village! 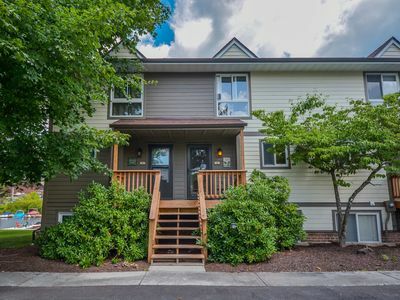 From the minute you arrive at this warm and inviting 2 bedroom, 1 full bath home, you will escape to a simpler time with all the modern conveniences you desire. 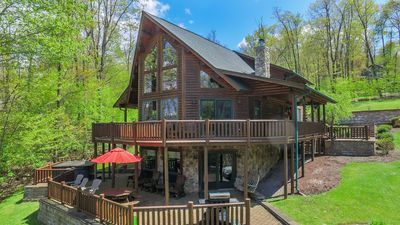 The main level envelops you with the uniqueness and charm from the great room with an old fashioned stone fireplace to warm up the chilling evenings and furniture that begs you to sit a while, to the quaint, yet full-sized kitchen with the cutest dining table. 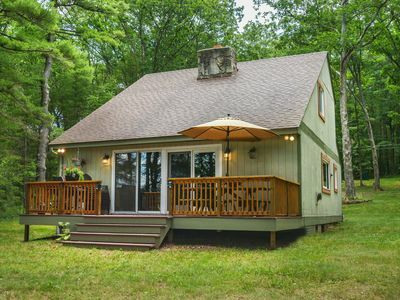 Two lodge-style bedrooms with a comfort that will guarantee you a wonderful night's sleep on newly installed mattresses and a full bath complete the first floor. 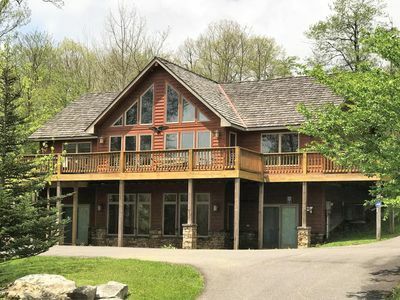 Venture up the unique stairs with a handmade railing to the loft overlooking the great room with a futon for additional sleeping space and an inviting seating area with a bookshelf of goodies and a TV. 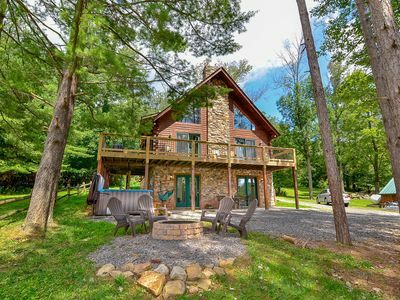 The loft makes a perfect getaway space for the children to have their own Deep Creek Lake adventure! 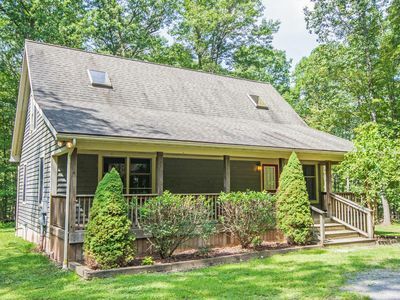 For your added convenience, this cabin offers a stackable in-home washer and dryer, and an air conditioning unit and ceiling fans for the warm summer days. 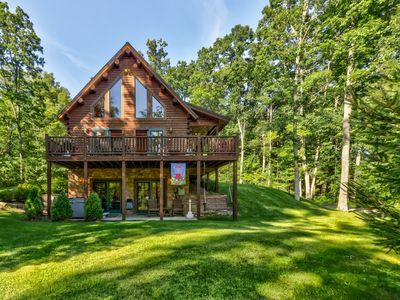 Comfort abounds in this cabin in the woods. 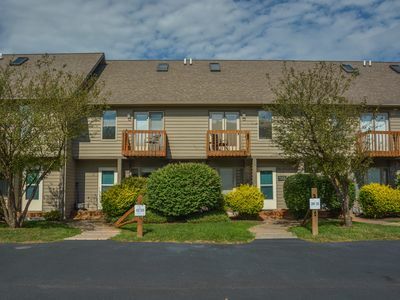 The outdoor amenities do not disappoint either. 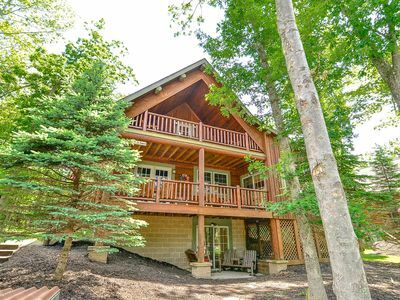 The front porch calls you to sit and relax a while in the Adirondack chairs, take a deep breath of clean mountain air, and look at the beautiful wooded scenery. 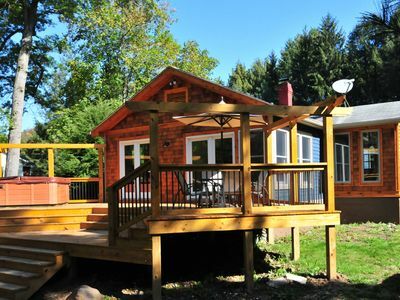 A small deck private deck offers a hot tub perfect for a relaxing soak and an outdoor charcoal grill. 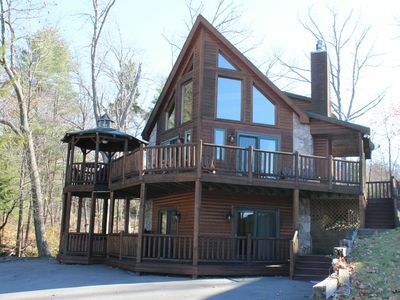 This cabin is located inside Yellowstone Village with a private paved road thru perfect for walking, running or biking. 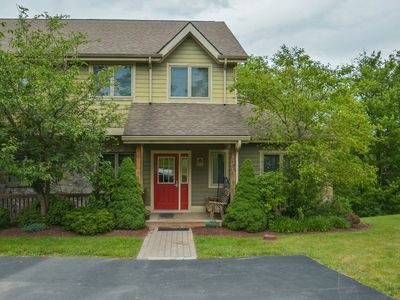 Just off one of the main roads through the resort area, this home is in the ideal location for enjoying a private community, yet just a few minutes from all the amenities and activities Deep Creek Lake has to offer, including groceries, cinemas, and restaurants. 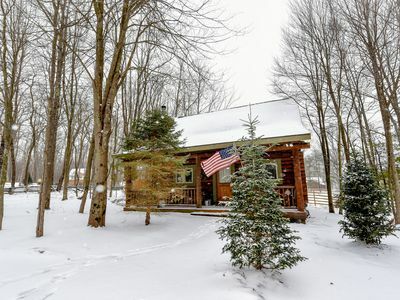 This cabin is perfect for putting the romance back in your relationship, or for a small family looking to reconnecting with each other – What are you waiting for? 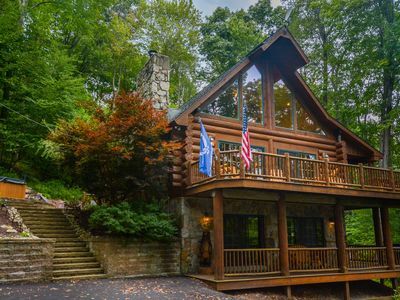 Adventures happen in this spectacular 4 Bedroom Mountain Log Home! 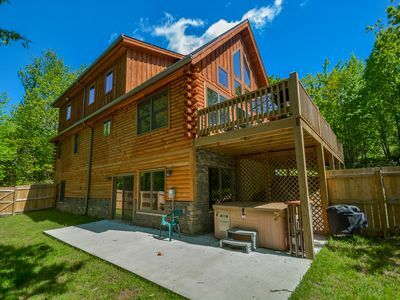 Walk to Wisp Resort from this conveniently located townhome! 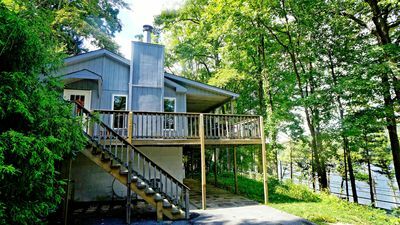 Captivating 2 Bedroom cottage with hot tub offers amazing river access! 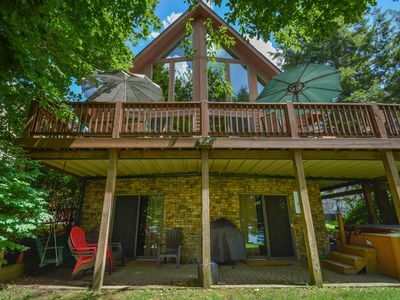 Charming Lake Front Cottage with Private Dock! 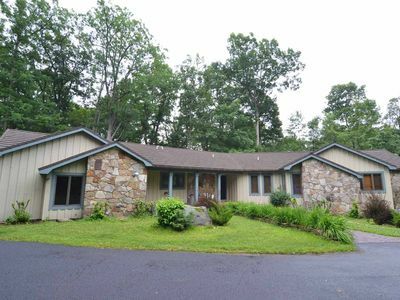 Dog-friendly lakefront home w/ hot tub! 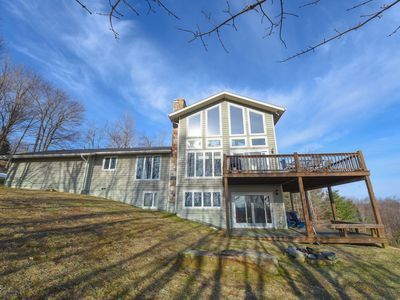 Spectacular lake and ski slope views! 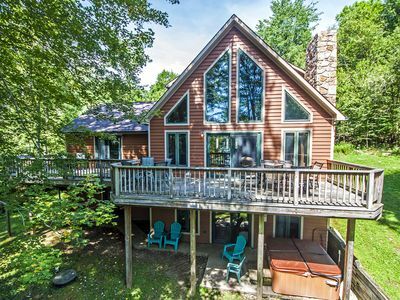 Classic chalet close to Wisp & lake activities!